For culture to thrive, the youth must be fully included as they are tomorrow’s custodians. 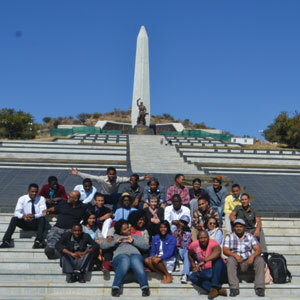 Arnold Okkers reports on one such cultural exchange visit to the Namibia Wilderness Therapy (NWT) in Windhoek where the youth got to experience culture first-hand. This year, 7 learners from Cloetesville Senior Secondary School and Stellenzicht Senior Secondary School, accompanied by 6 staff from Usiko Stellenbosch, embarked on a cultural exchange visit to the Namibia Wilderness Therapy (NWT) in Windhoek. 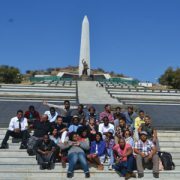 During the visit, the youth- selected after completing research papers about Namibia and Stellenbosch- attended lessons with their counterparts in Namibia, went to museums and had very meaningful interactions on culture where they learnt about dress codes, cultural norms and values. In their research papers they had had to make submissions on various aspects of culture; the crowning moment being reliving the same culture first-hand. In this regard, this group was the pioneer group, so to speak. Usiko Stellenbosch’s hope is that the same experience can be granted to the next upcoming group of graduates. Phiweka Mantashe, one of the participants, said: “Thanks again for the trip to Namibia. I learnt a lot, experienced lots of new things and for that I’ll forever be thankful.”One of the dreams of the not-too-distant future is to host a group of Namibian youth in Stellenbosch to give them a South African experience.